Self-proclaimed ‘Hoonigan’ Ken Block has a unique take on motor racing and his latest Gymkhana car is proof of that. The rally driver/viral video star has revealed this wild one-of-a-kind 1965 Ford Mustang notchback that will star in the Gymkhana Seven video. Developed by Block’s own Hoonigan Racing Division and Mustang specialists RTR the unique machine has been dubbed the ‘Hoonicorn RTR’ by Block. Inspiration for the car came from Block’s love of World Rally Cars, German DTM touring cars and even toy cars from his childhood. The retro Mustang is a major departure for Block’s Gymkhana videos, he has previously used rally or rallycross cars as the weapon of tyre-torture. The Gymkhana series started with a Subaru WRX STi before he switched to the Ford Fiesta from the third video onwards. The Hoonicorn is not your average ’65 ‘Stang. Under the bonnet is a 6.7-litre Ford V8 built by NASCAR experts Roush Yates Racing Engines that produces 630kW of power and 976Nm of torque. That grunt is sent to all four wheels via an all-wheel drive system developed by transmission specialists Sadev. Block revealed the car at the SEMA show in Las Vegas overnight having already finished filming the latest installment in his hit internet video series. 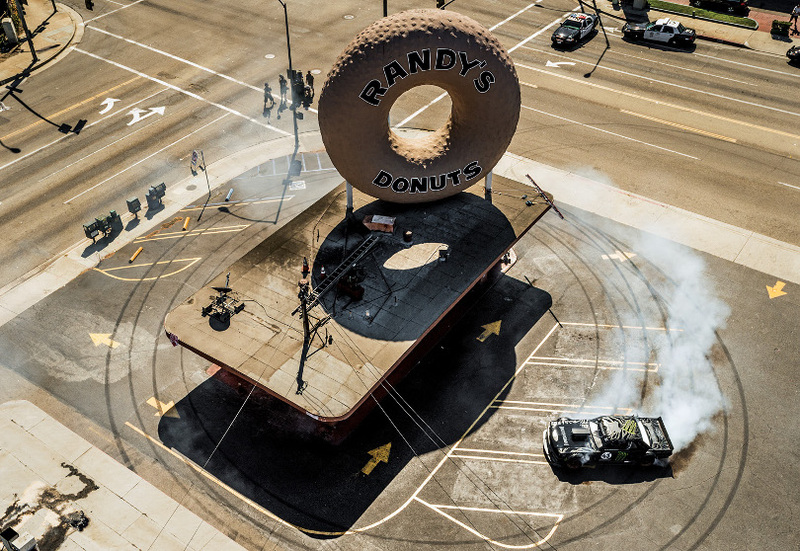 Block and the Hoonicorn were caught filming in Los Angeles in October. Transmission: 6-speed sequential gearbox, all-wheel drive with a hydraulic handbrake system.